It’s been a pleasure being able to help you. Please help me by submitting a review. Your feedback is very valuable to me. I strive to deliver a 5-Star experience. In addition it also helps prospective clients know the extraordinary service they can expect. Want to Buy a Home? Are You Ready? Ready to buy a home? Before you take the leap in homeownerships, there are a few things to consider before buying your first home. When purchasing a home, it’s important to know how much the house really costs. This extends beyond the purchase price of the house. Did you know that there are many additional costs associated with homeownership? Depending on where you live, in addition to the mortgage payment there are various expenses including closing costs, taxes, insurance, and utility costs that could increase your monthly payments. That’s just to name a few. Don’t forget about maintaining the house too. Make sure that you estimate all of the extra expenses that go along with home ownership to ensure that you don’t over-extend yourself financially. Getting a mortgage is easy, right? Not if you have a bad credit score! If you don’t already know, your credit score is a number generated using the information in your credit report. It is intended to predict risk of default on your debt. Do you know your credit score? People with a credit score above 750 get the best rates for borrowing money. Now many credit cards offer services in which they provide you with your credit score. Don’t have good credit? If you are thinking about buying a home, start repairing your credit immediately. The first thing to do is start paying down your debts. Keep your debts below 25% of your available credit. In addition to paying down some of your debt, run your credit report. Make sure there are no mistakes on it. Federal law mandates that you can get a copy of credit report from the three credit agencies (Equifax, Experian, and TransUnion) for free each year. Watch out for websites that charge you for a credit report. Make sure you visit www.annualcreditreport.com to get a free credit report. Getting a pre-approval letter from the bank will let you know how much a bank is willing to lend you. This in turn, will let you know how much property you can purchase. Not only does it provide you with the amount of money the bank is willing to lend to you, but it also sends a message to the seller that you can afford the property and easily obtain a mortgage. Often a deal falls apart when the buyer fails to obtain financing for a property. Having a pre-approval letter from the bank is significant to the buyer by giving them confidence that you will be able to get a mortgage and may give you a competitive edge if there are multiple offers. Where do you want to live? Selecting the perfect house can be challenging. Often you may find a house that has many of the things that you like, but you may have to compromise on a few things. While it is easy to change/update some things (like paint color or a bathroom remodel), one thing that won’t change is the location of the property. Know the neighborhood that you are buying into. If are not all that familiar with the area, make sure that you visit the area several times to get a good feel for the neighborhood. Visiting in the morning and evening during the week and on the weekends will give you a good sense of what the area is like and what type of traffic is around. Once you identify the perfect house and are comfortable with the price and location, it’s time to make that offer! Knowing your credit score, selecting and getting pre-approved for a mortgage, identifying the perfect location for your home, and understanding the hidden costs of home ownership will help you get ready to purchase your first home. There’s no doubt that this process can be stressful. Purchasing a house can be extremely difficult. Using a licensed salesperson as your agent can dramatically reduce the stress and they will walk you through the complicated process of buying your house. When searching for an agent, you need to find one you can trust. In the Hudson Valley, call or text Chris Cammarata at (845) 420-4562. You can also follow him on Facebook (@CPCamm), Twitter (@ChrisCamm), Instagram (CPCamm), and SnapChat (cpcamm). Where it all began... and where I am going. Ever since I was a child, I had an interest in real estate. Maybe I got it from watching my father. From an early age, I watched him invest in real estate. My father has a tremendous work ethic and I've witnessed him manage and repair the various rental properties he's owned over the years. I didn't think I could be the type of person to get into real estate. Having two children there is a need for a constant flow of income and not take the risk of not knowing when my next paycheck would come. Not until I spoke with a broker did I realize that I having one job while entering into the real estate industry could be an advantage. She said having a job that provides a consistent source of income would allow me to enter the industry and reduce the risk of leaving; like so many others do because of the amour of time it takes to to get established and start earning income. It allows me to grow my real estate network, work with a few clients at a time, and allow me to give my clients the attention they deserve and represent their true interests. I truly enjoy helping others. That is one of the reasons I've spent nearly 20 years working in the public sector. Venturing into real estate I look forward to utilizing my personal experience along with my love for real estate, technology, and marketing to help those in my community sell and buy real estate. I am enjoying the transition into my new career and look forward to working with you whenever you need a Realtor. Are you considering selling and/or buying a home? When searching for an agent, you need to find one you can trust. 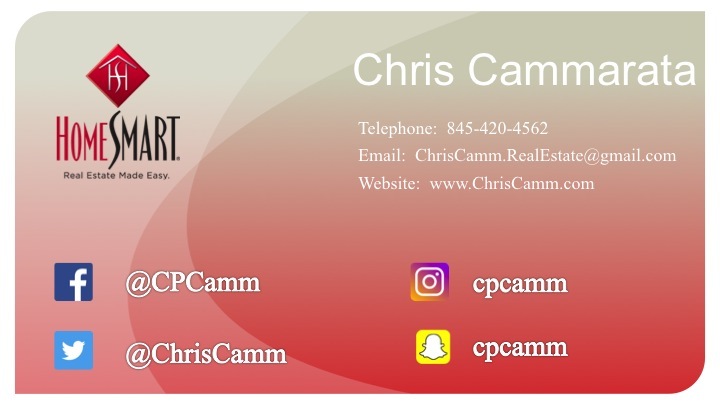 If you are in the Hudson Valley call or text me at (845) 420-4562 and follow me on Facebook (@CPCamm), Twitter (@ChrisCamm), Instagram (CPCamm), and SnapChat (cpcamm).